YEREVAN, April 23. /TASS/. 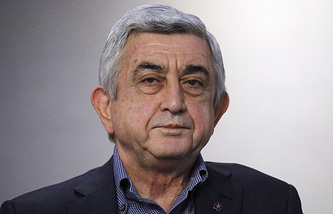 Armenia’s First Deputy Prime Minister Karen Karapetyan has been appointed acting Prime Minister following resignation of his predecessor, Serzh Sargsyan, who was head of government for less than a week, the press service of the Armenian government said on Monday. "In accordance with the law on the structure and activities of the government and reckoning with Serzh Sargsyan’s letter of resignation, the cabinet agreed that Serzh Sargsyan cannot stay in office any longer," the press service told TASS, adding that in such cases the first deputy prime minister is appointed acting head of government. Armenia’s Prime Minister Serzh Sargsyan, who was elected to this post by the national parliament on April 17, stepped down on Monday amidst mass rallies that has been underway in Yerevan and other cities of Armenia since last Monday protesting against his nomination. Sargsyan met with opposition leader MP Nikol Pashinyan at Yerevan’s Marriott hotel on Sunday morning. The opposition leader demanded Sargsyan step down while the latter said it was inadmissible to try to intimidate the legitimate authorities. The talks were interrupted after that. Also on Sunday, the Armenian prosecutor general’s office confirmed the arrest of opposition lawmakers Nikol Pashinyan, Ararat Mirzoyan and Sasun Mikaelian on charges of holding unauthorized rallies. All the three were released on Monday.